Lot 392. 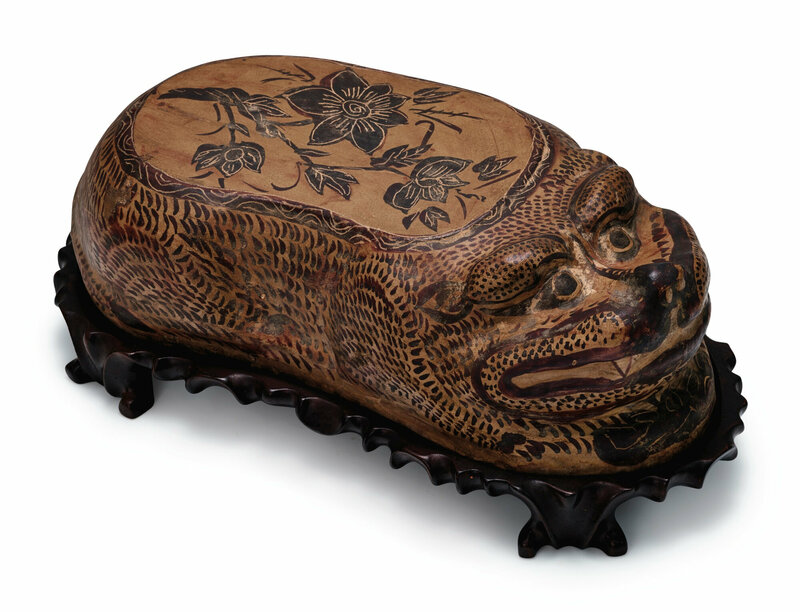 A rare browm-splashed 'Tiger' pillow, Song dynasty (960-1279); 18.4 cm, 7 1/4 in. Estimate 20,000-30,000 HKD. Lot sold 300,000 HKD (33,713 EUR). © Sotheby's. 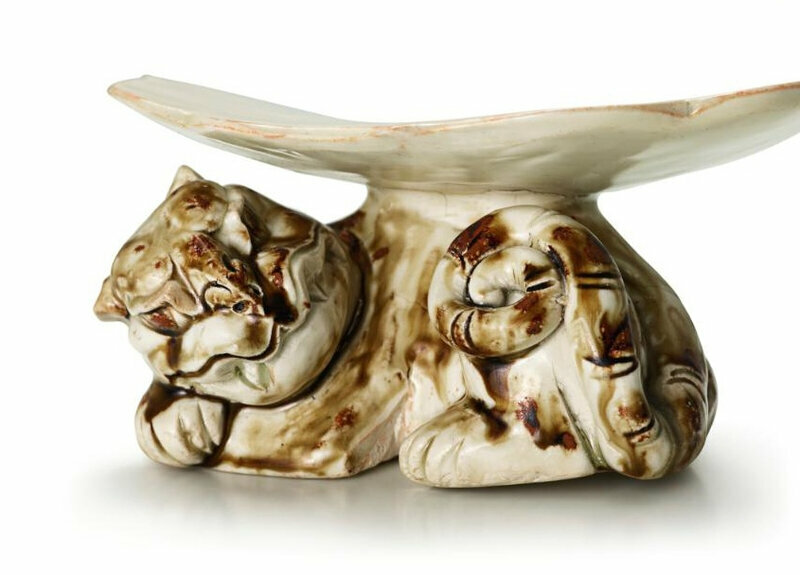 the ruyi-shaped headrest supported on a recumbent tiger, covered overall in a creamy-white glaze with russet stripes. Note: See a figure of a tiger decorated in a similar style, sold in these rooms, 31st May 2018, lot 422; and a figure of a hen and another of a dog belonging to the same group, sold in these rooms, 30th November/1st December 2017, lot 468. Compare also a figure of a tortoise and snake and one of a stork perched on rocks in the Museum of East Asian Art, Bath, illustrated in Brian McElney, Inaugural Exhibition Volume 1, Chinese Ceramics, Bath, 1993, nos 65 and 67. Lot 393. Two Cizhou 'Floral' pillows, Ming dynasty (1369-1644); 24 cm, 9 1/2 in. Estimate 30,000-50,000 HKD. Lot sold 43,750 HKD (4,917 EUR). © Sotheby's. 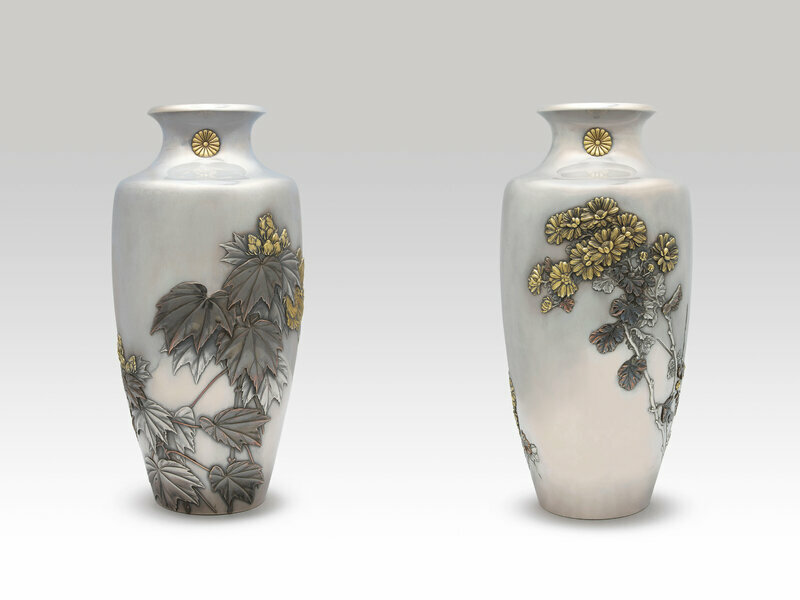 the first painted to the top with floral sprays, covered overall in a creamy-white glaze; the other decorated to the top with a flower pot, covered overall in a light olive-brown glaze. Lot 394. A white-glazed 'Deer' pillow and a brown-glazed pillow, Song dynasty (960-1279); 20.1 and 15.8 cm, 7 7/8 and 6 1/4 in.. Estimate 20,000-30,000 HKD. Lot sold 162,500 HKD (18,261 EUR). © Sotheby's. 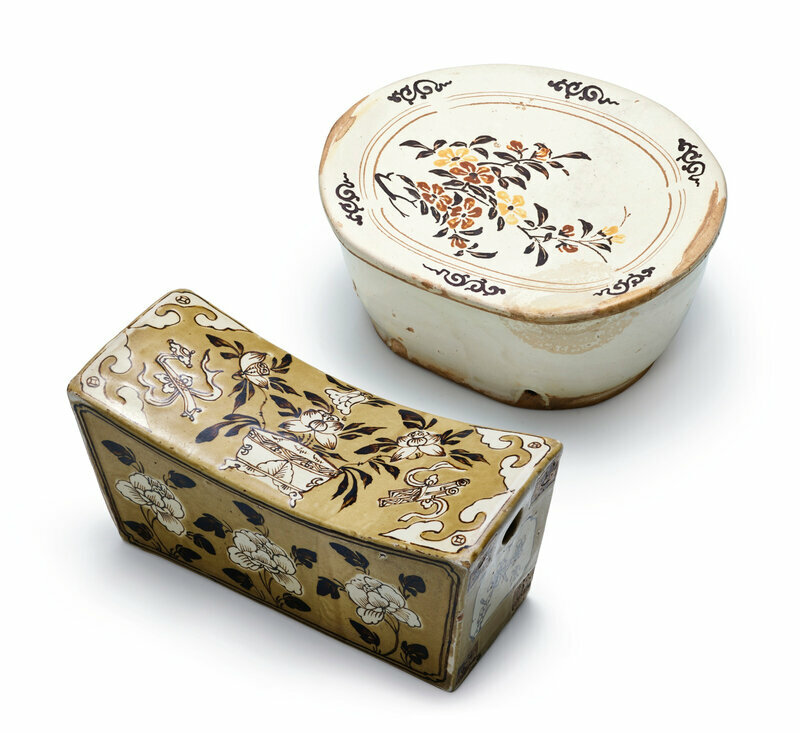 the first of trapezoidal section, the top decorated with floral diaper patterns, the sides carved in relief with deer; the other decorated to the top with a butterfly and glazed olive-brown. Lot 395. 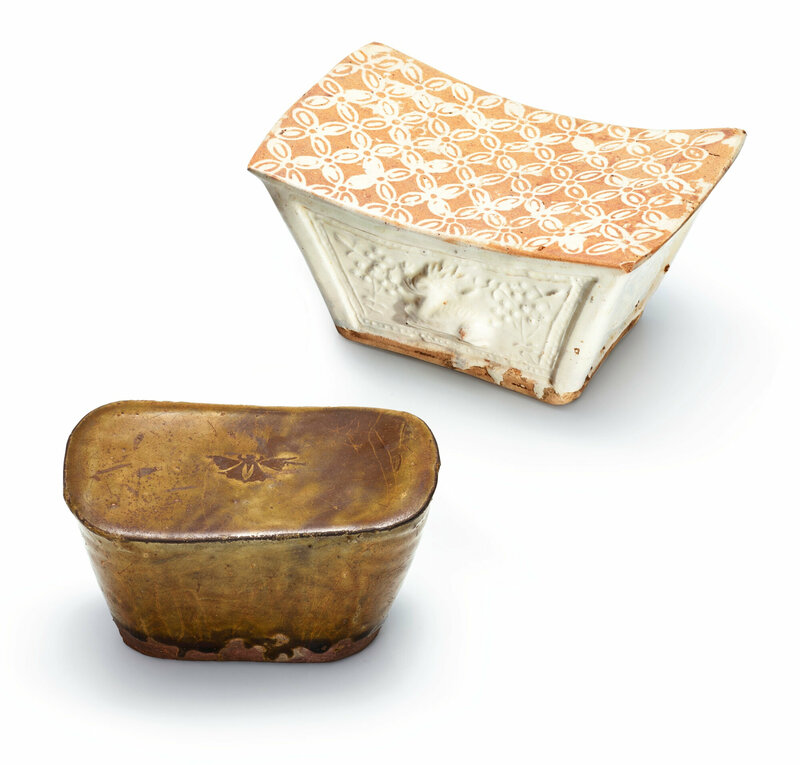 Two Cizhou white-glazed pillows, Song dynasty (960-1279); 18.2 and 25.8 cm, 7 1/8 and 10 1/8 in. Estimate 20,000-30,000 HKD. Lot sold 162,500 HKD (18,261 EUR). © Sotheby's. 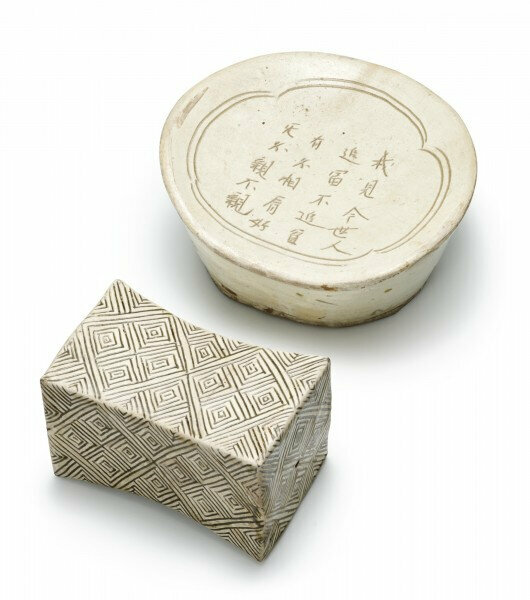 the first of waisted rectangular form, carved through the white slip with geometric pattern; the concave top of the other incised with a poetic verse. Lot 396. A russet-splashed black-glazed pillow, Song dynasty (960-1279); 24.3 cm, 9 5/8 in. Estimate 70,000-90,000 HKD. Lot sold 250,000 HKD (28,094 EUR). © Sotheby's. 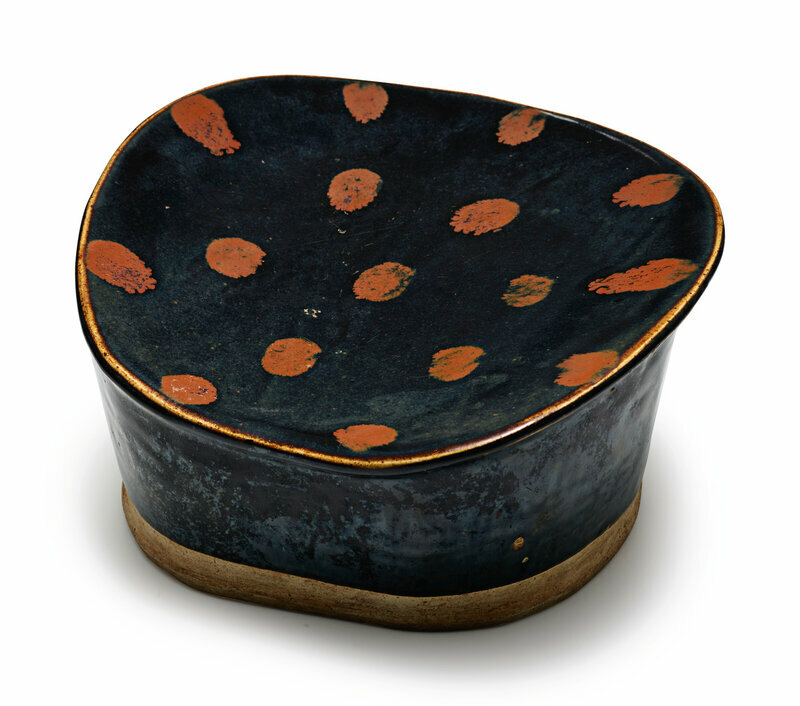 of kidney shape, veiled overall save for the base with a black glaze, picked out with russet spots on the concave top. Compare a related pillow sold in our New York rooms, 1st June 1994, lot 267; and another with a lighter body colour and a more regular distribution of russet spots, exhibited in Song Ceramics from the Kwan Collection, Hong Kong Museum of Art, Hong Kong, 1994, cat. no. 24. 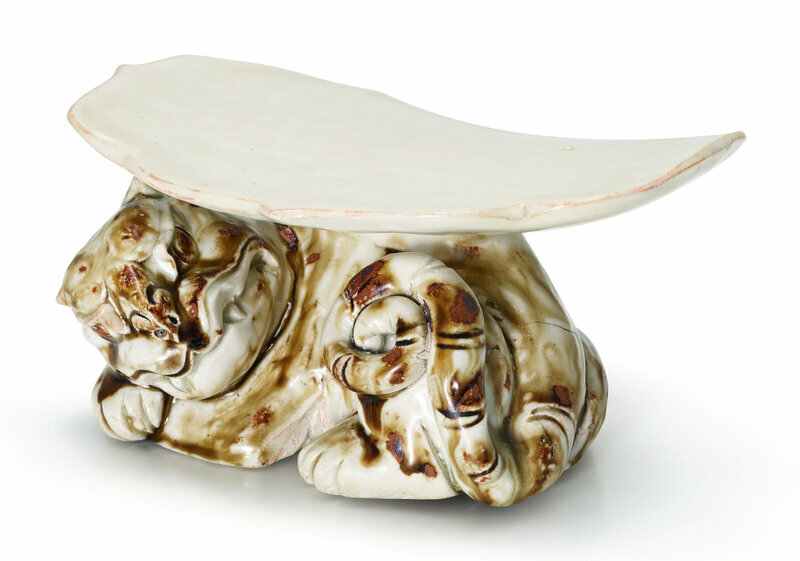 See also a pillow from the collection of Edward T. Chow, illustrated in Regina Krahl, Chinese Ceramics from the Meiyintang Collection, London, 1994, vol. 1, no. 464. Lot 397. A rare Cizhou 'Tiger' pillow, Jin dynasty (1115-1234); 33.8 cm, 13 1/4 in. Estimate 60,000-80,000 HKD. Lot sold 52,500HKD (5,900 EUR). © Sotheby's. modelled in the form of a recumbent tiger, liberally splashed with russet, the back painted with floral sprays. 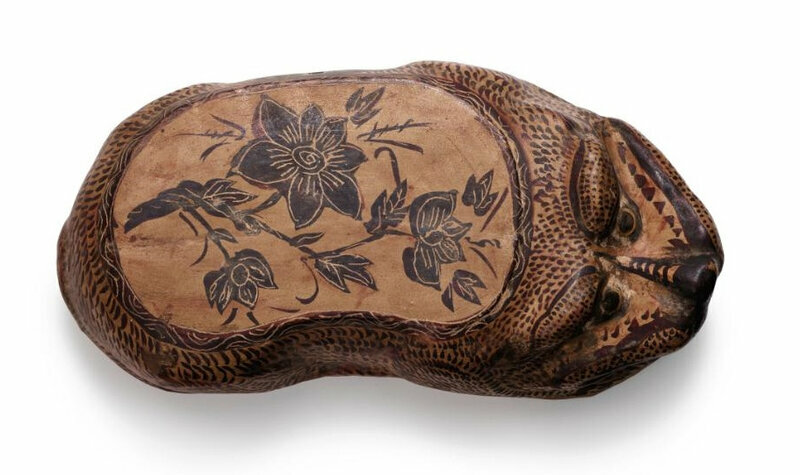 Note: Compare a brown-glazed tiger-shaped pillow dating to the Jin dynasty, collected from the Xiuwu County, Henan province, now presented in the collection of the Henan Provincial Museum and illustrated on the museum website. Lot 398. A Cizhou 'Figural' pillow, Jin-Song dynasty; 40.5 cm, 16 in. Estimate 30,000-50,000 HKD. Lot sold 187,500 HKD (21,071 EUR). © Sotheby's. 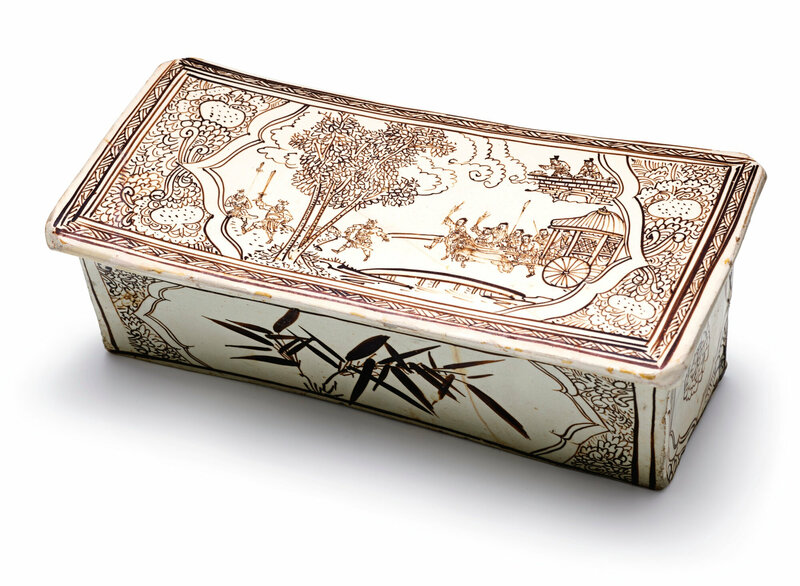 of rectangular form, the top painted in brown over a creamy-white slip with a military scene within a shaped cartouche reserved on a floral ground, the sides with floral cartouches, the base with a mark reading guxiang Zhang jia zao. 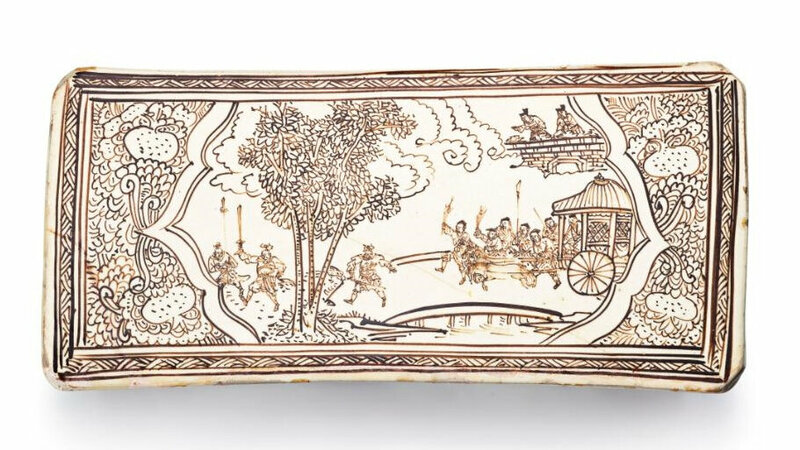 Note: A related Cizhou pillow, also with a Zhang jia zao mark, is in the Beijing Palace Museum, illustrated in The Complete Collection of Treasures of the Palace Museum: Porcelain of the Song Dynasty (I), Hong Kong, 1996, pl. 154. 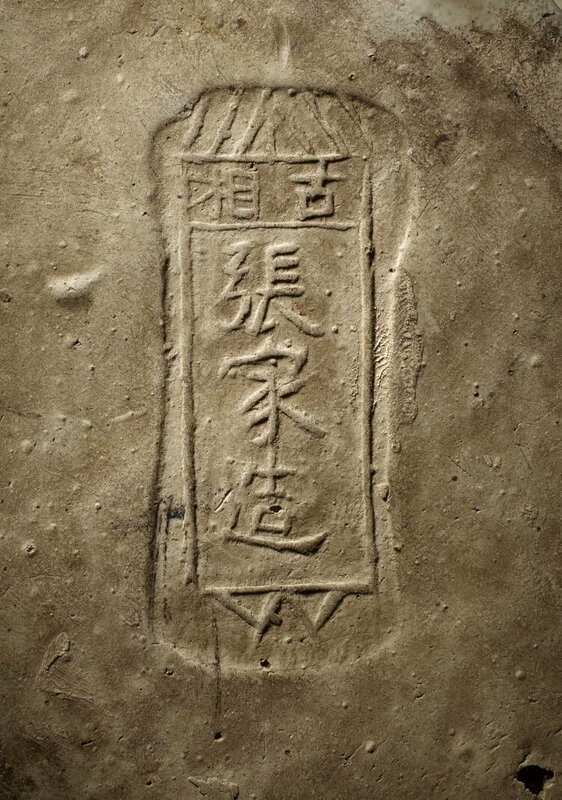 Compare also a Jin dynasty Cizhou pillow, also from the Zhang Family Workshop and similarly decorated with a lobed cartouche enclosing a military scene, in the British Museum, London, museum no. 1936,1012.165. Lot 399. A sancai pillow and a Cizhou green-glazed pillow, Song dynasty (960-1279); 20.3 and 27 cm, 8 and 10 5/8 in. Estimate 20,000-30,000 HKD. Lot sold 275,000 HKD (30,904 EUR). © Sotheby's. 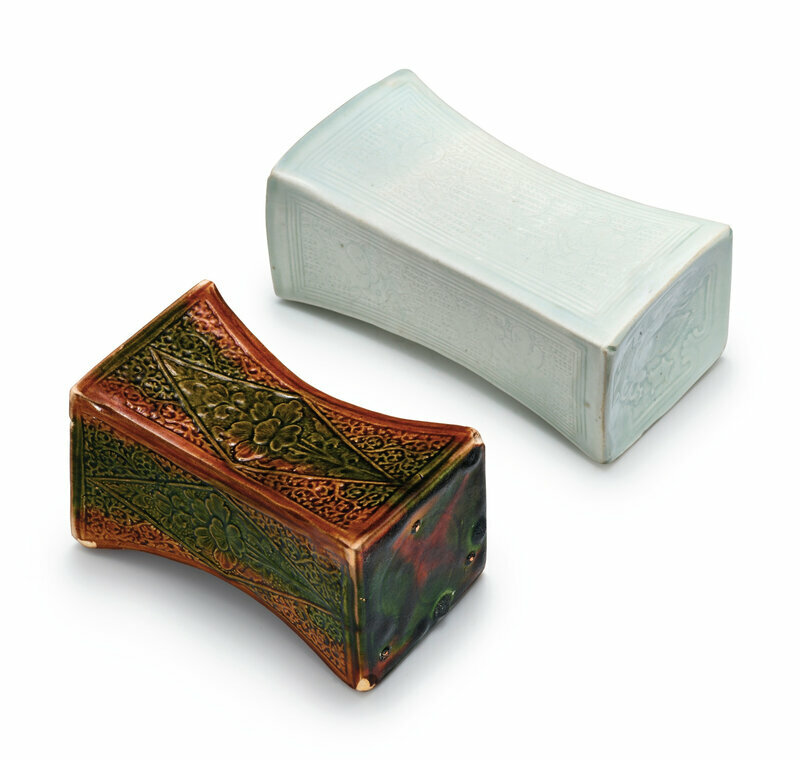 the sancai pillow of trapezoidal section, the sides decorated with floral scrolls; the other of ruyi-head form, glazed green with crackles. Lot 400. Two Cizhou pillows, Song dynasty (960-1279); 43.5 and 34.5 cm, 17 1/8 and 13 5/8 in. Estimate 30,000-50,000 HKD. Lot sold 237,500 HKD (26,690 EUR). © Sotheby's. both pillows carved and decorated to the top with flower sprays. Lot 401. 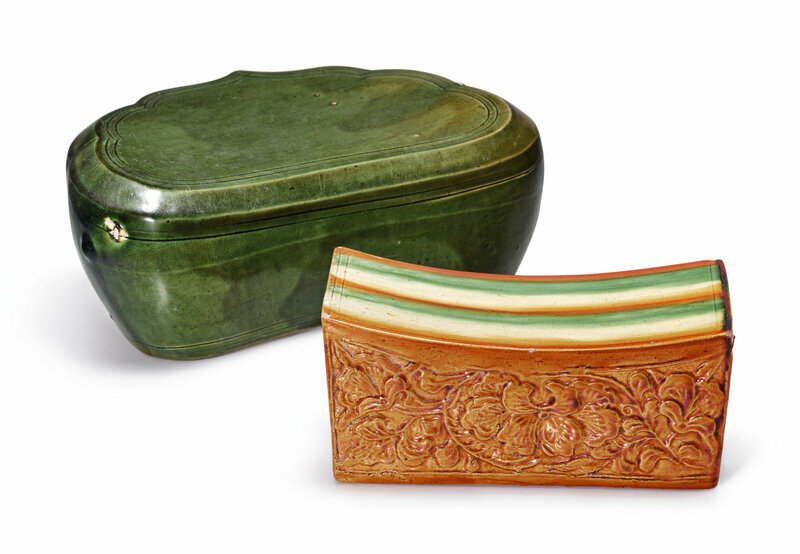 Two sancai pillows, Song dynasty (960-1279); 17.6 and 16.1 cm, 6 7/8 and 6 3/8 in. Estimate 20,000-30,000 HKD. Lot sold 118,750 HKD (13,345 EUR). © Sotheby's. the ingot-shaped pillow decorated with foliate 'fish' cartouches against a coin-diapered ground; the other carved to the top with flower sprays, the sides with lotus blooms moulded in relief. Lot 402. 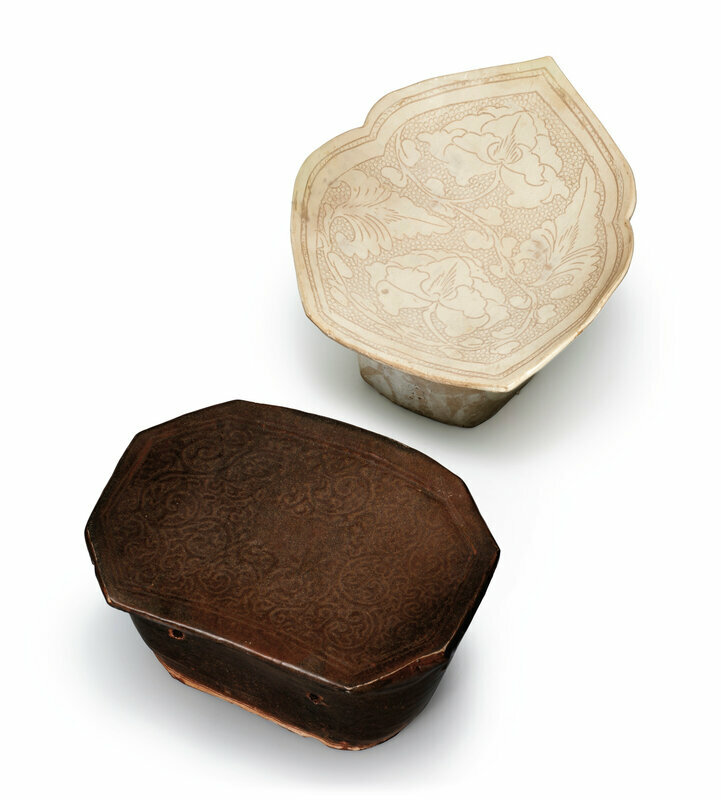 Two Cizhou 'Lotus' pillows, Song dynasty (960-1279); 25.5 and 27.2 cm, 10 and 10 3/4 in. Estimate 20,000-30,000 HKD. 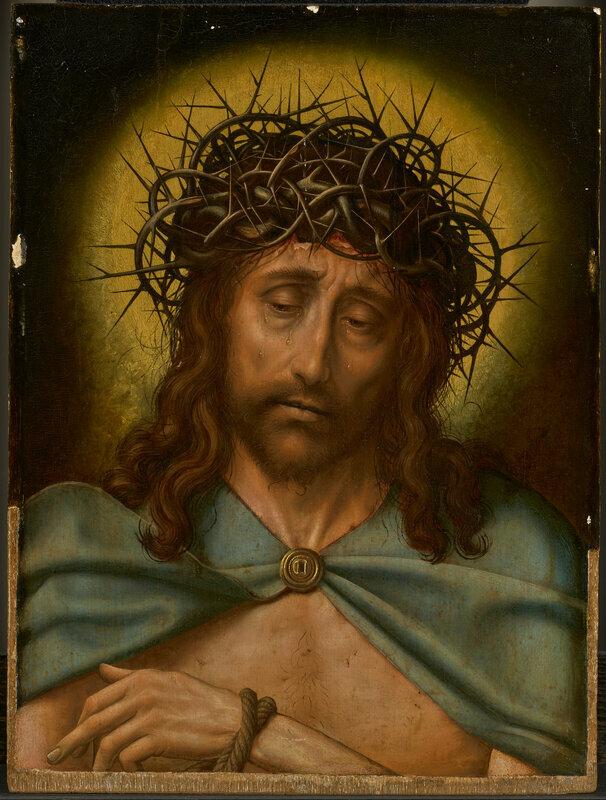 Lot sold 200,000 HKD (22,476 EUR).© Sotheby's. 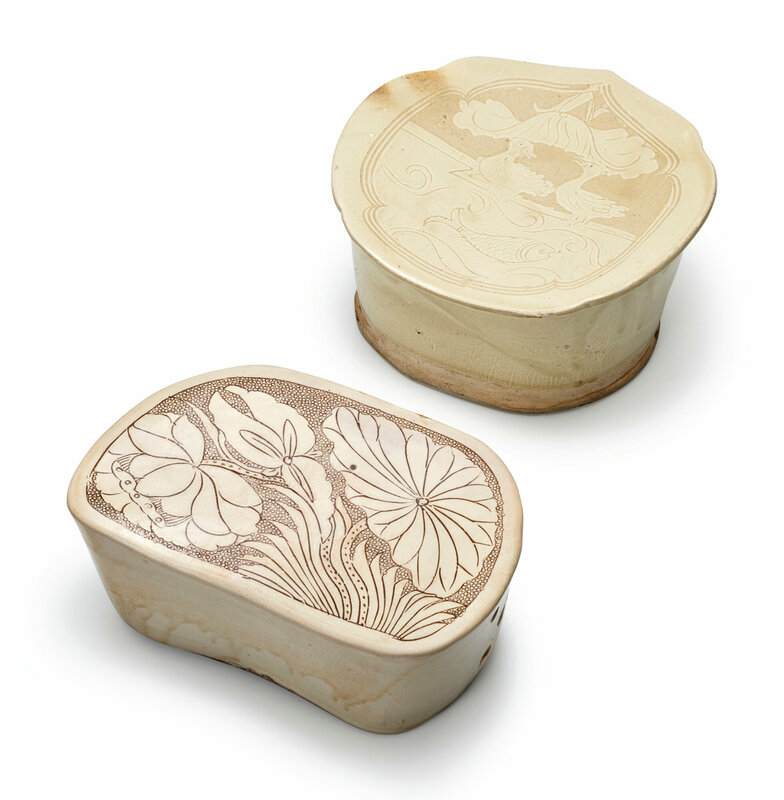 the first carved through the white slip with a pair of mandarin ducks and a fish in a lotus pond; the other carved in a brown slip with lotuses and a lotus pod. A related Northern Song dynasty pillow, decorated with a large furled lotus leaf and bloom, was exhibited in Chinese Ceramic Pillows: the Mr. & Mrs. Yeung Wing Tak Gift, Museum of the Western Han Tomb of the Nanyue King, Guangzhou, 1993, cat. no. 50. Lot 403. A Qingbai pillow and a sancai pillow, Song dynasty (960-1279); 21.1 and 17.1 cm, 8 1/4 and 6 3/4 in. Estimate 10,000-20,000 HKD. Lot sold 250,000 HKD (28,094 EUR). © Sotheby's. 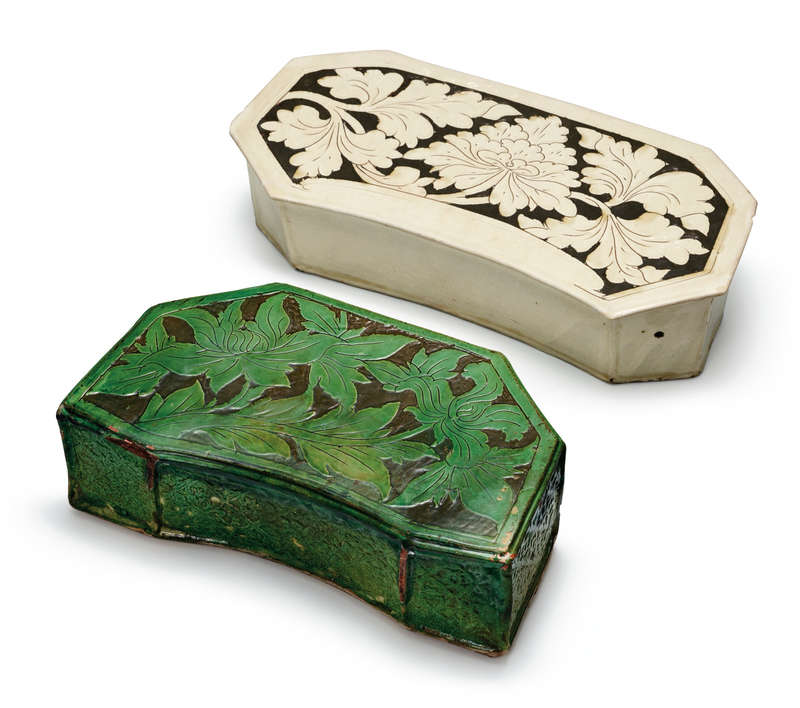 both of waisted rectangular form; the qingbai pillow decorated with ten boys; the sancai pillow carved with 'floral' cartouches reserved on a floral ground. Lot 404. A Cizhou 'Tiger' pillow and a 'Bird' tiger-form pillow, Jin dynasty (1115-1234); 26.3 and 24 cm, 10 3/8 and 9 1/2 in. Estimate 10,000-20,000 HKD. Lot sold 175,000 HKD (19,666 EUR). © Sotheby's. 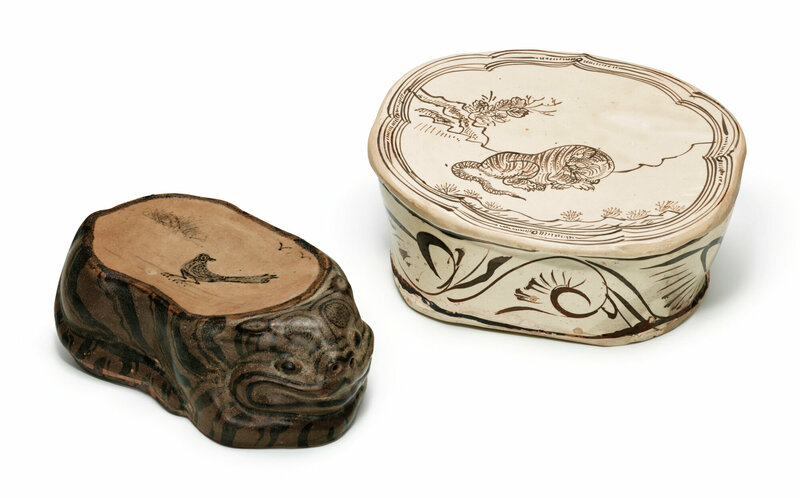 the first of ruyi-head shape, the top painted in brown slip with a tiger against a cream ground, Zhang jia zaomark; the other modelled as a recumbent tiger, the upper surface painted with a bird. 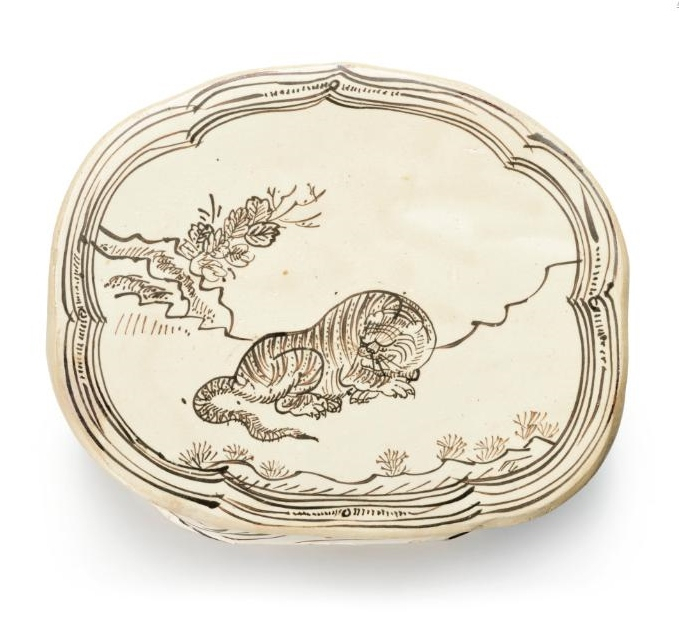 See a similar Cizhou 'tiger' pillow in the Beijing Palace Museum, illustrated in The Complete Collection of Treasures of the Palace Museum: Porcelain of the Song Dynasty (I), Hong Kong, 1996, pl. 158. Lot 405. A Cizhou 'white-glazed pillow and a brown-glazed pillow, Song dynasty (960-1279); 26.3 and 24 cm, 10 3/8 and 9 1/2 in. Estimate 50,000-70,000 HKD. Lot sold 37,500 HKD (4,214 EUR). © Sotheby's. 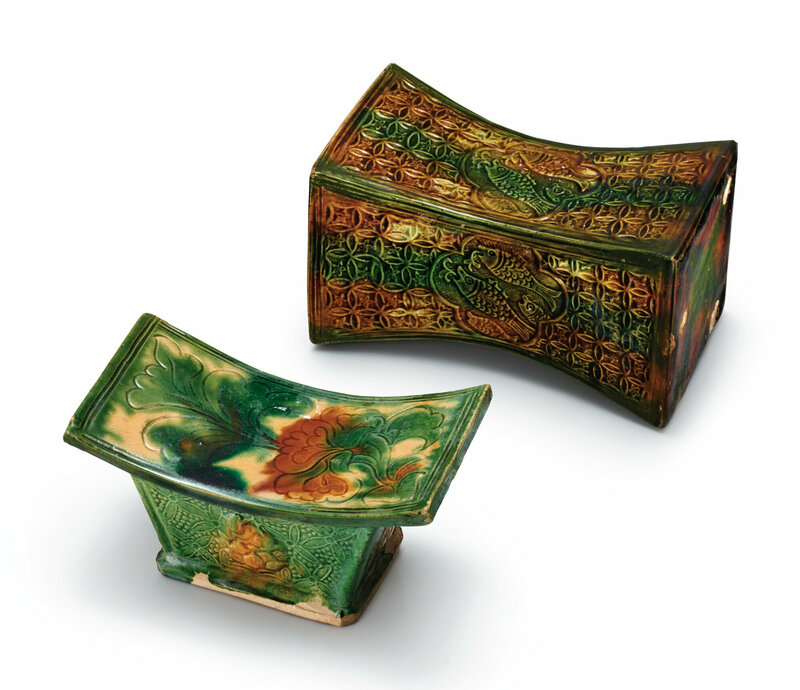 the first with a ruyi-shaped headrest incised with peony sprays, covered overall in an ivory-tinged glaze; the other of octagonal section, decorated with foliated scrolls. Lot 406. 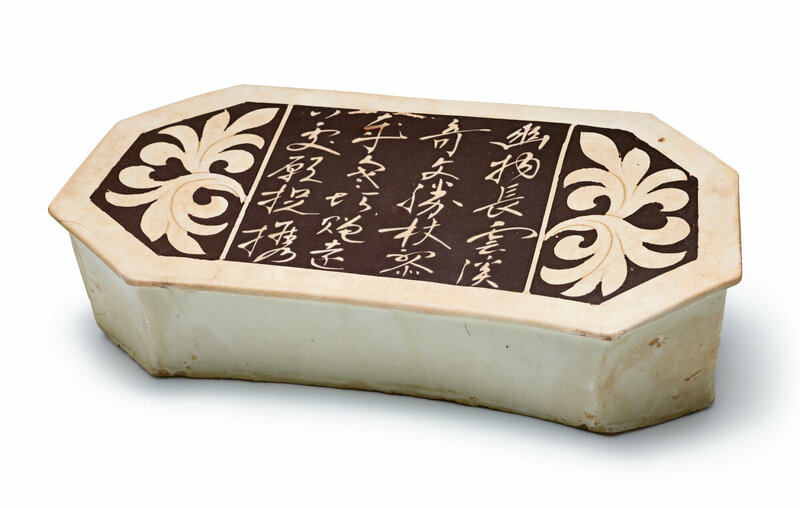 An inscribed Cizhou 'white-ground painted pillow, Song dynasty (960-1279); 44 cm, 17 3/8 in. Estimate 30,000-40,000 HKD. Lot sold 200,000 HKD (22,476 EUR). © Sotheby's. Note: Compare a similarly modelled pillow, decorated with an inscription flanked by foliage on the sides against a dark brown ground, included in Chinese Ceramic Pillows: the Mr. & Mrs. Yeung Wing Tak Gift, Museum of the Western Han Tomb of the Nanyue King, Guangzhou, 1993, cat. no. 87.